The first practical schematics for the internet had not arrived until the early 1960s when JCR Licklider, a psychologist and computer scientist from MIT popularised the idea of an “intergalactic network” of computers. In fact, the first workable prototype of the internet came in the late 1960s with the creation of ARPANET. The online world then took on a more recognisable form in 1990, when computer scientist Tim Berners-Lee invented the World Wide Web. By 2007, the number of internet users hit one billion and within the next five years, the numbers doubled. With the advent of tablets and smartphones, the internet usage on these handheld devices has exceeded that of a personal computer. Information has become more accessible and personal — and this works both ways. A customer checks the best available option with just a click and at the same time, customer-centric companies run algorithms, tailoring the recommendations and enriching the experience. The Steam engine which flagged off the industrial revolutions had a steady run for at least 200 years. But, a revolution in the 21st century doesn’t take that long. It can be done for over a decade. In 21st century, most disruptions are initiated in the virtual world, which makes them difficult to recognise until after the impact is felt. A disruption at the digital level can occur in two main premises — business and technology. Companies like Amazon offer a great example of disruptive strategies. They are more customer focussed than competitor focussed. In such a scenario, the strategy usually more on the offensive side. Whereas, what ensues after the offensive disruption is the defence of the competitors who try to retain whatever is left of their niche markets. These competitors go the formulaic route at least as a short term plan while they rack up on their innovation end. This process dog eats dog strategy can face a disruption of its own when some innovation remote to the domain, an idea which begun just for the sake of it and suddenly finds applications on a large scale. Such strategies have no specific goal nevertheless, they disrupt. Companies like Apple, more or less follow the self-disruptive strategy. For instance, a new iPhone gets released every year with better features, customers still buy these knowing for a fact that there will be a better one soo. Not long ago, iPhone sales have overshadowed that of iPod. So the strategies used for disruption aka get a larger piece of the pie, can be customer focussed, competitor focussed, money focussed or sometimes can be more personal and destructive. 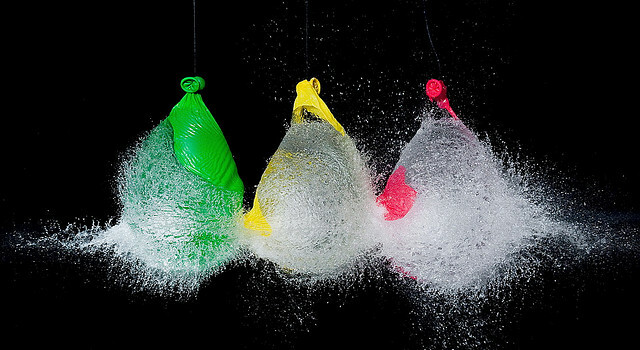 A disruption can be defined in layman terms as 10x increase in business profitability. Like the Amazons and the Ubers of this world. Use a machine learning model, use existing GPS technology, run them on remote data centres and grab the biggest chunk of the retail market and commuting services. The offline stores and traditional commuter services had no clue what was coming their way. Those who chose to stay oblivious to the advancements are now deemed obscure. While few latecomers made smart moves to collaborate in a face-changing or saving manoeuvre. Most digital disruptions are initiated in the virtual world, which makes them difficult to recognize until after the impact is felt. Netflix’s initial business model included DVD sales and rental by mail. Netflix expanded its business in 2007 with the introduction of streaming media while retaining the DVD and Blu-ray rental service. Netflix has greatly expanded the production and distribution of both film and television series since 2012 and offers a variety of “Netflix Original” content through its online library. By January 2016, Netflix services operated in more than 190 countries. Netflix released an estimated 126 original series and films in 2016, more than any other network or cable channel. Along with offering services at light speed and with increased ease of accessibility, what these disruptors have in common is their improved experience for the customers. Customer-centric analytics has been at the heart of these successes. The accountability, these new age digital mammoths offer is, historically first of its kind. This puts the pressure back on the enterprises and they have to come with something new to go toe to toe with the competitors. 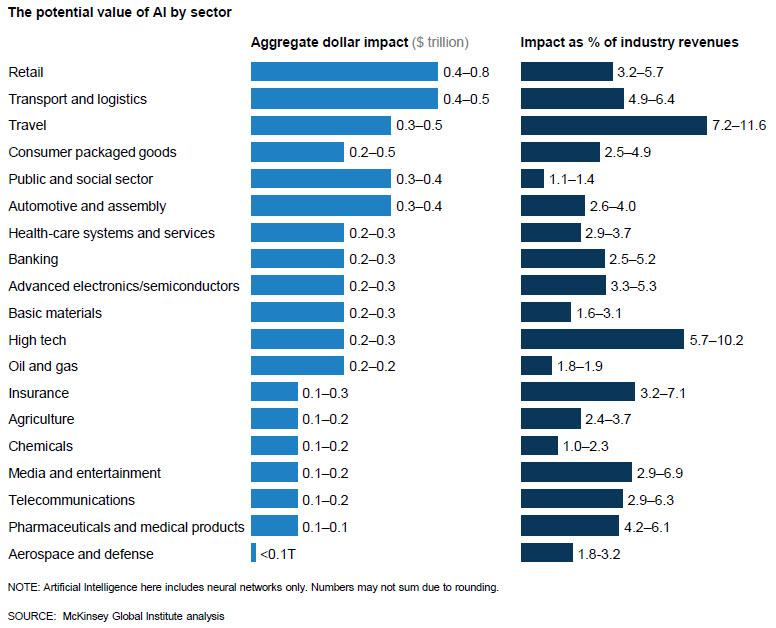 According to a leading financial daily, AI techniques have the potential to create between $3.5T and $5.8T in value annually across nine business functions in 19 industries. AI will generate up to $2.6T additional value in Marketing and Sales and up to $2T in Supply Chain Management and Manufacturing. The torrential inflow of data is enforcing the companies to take up data science route whether they like it or not or out of fear of missing out on customers to their competitors. Apart from the market dynamics, foray into the data-driven solutions also has significant pull from the fields with non-financial incentives such as healthcare, where the efficacy of the treatment is more important. For industries experiencing labour shortages, the automation and efficiency gains from AI will, in fact, strengthen these industries and preserve jobs in the long run. Travel companies, for example, are seeing real value in leveraging chatbots to create always-on, personalized concierge level service at scale. When machine learning is applied to drilling, information from seismic vibrations, thermal gradients, strata permeability, pressure differentials, and more is collected. From low-code platforms that leverage AI to automate software developers’ tasks to AI-empowered factory robots that automate assembly line activities, AI has already become an integral part of our work lives. There aren’t many fields that are immune to the AI takeover. This juncture is very crucial both at the localised company level and at the national level economic evolution; at least in the case of India where the population of youth is very large compared to other developing countries. The only problem here is, this population is largely unskilled. So, whenever we read that AI has eliminated jobs, it should be understood that now arises an opportunity to upskill the employees and equip them with the tools required to contribute for the necessary and inevitable transition, instead of abandoning them altogether. So, the sequence is seemingly obvious here — first, a risk taker shifts specific domain of services to a newer platform, a shift in customer dynamics and the competitors follow the swing of customers, backed up by new strategies and innovation. The end result, often, is more innovation, availability and enriched customer experience after every disruption.